Today Teena and I went early to Ripley's Aquarium of Canada. 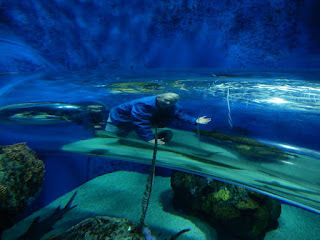 This was our third trip to the aquarium and it is always interesting and breathtaking. I always find something new and incredible there. You arrive above where you can look down at the "petting area". A rare blue lobster. There also was a huge white one too that I had trouble getting a picture of it. This aquarium with all the kelp simulates the flow of the ocean and a walkway comes down around it so you can view it from many angles. Look at the size of this tank. Teena puts her camera skills to use in front of it. Where the sharks are. This tank is huge. A moving sidewalk takes you around it and there is also enough room to walk around or stand to watch or take pictures. In other areas, there are places to go and view the fish from inside. A seahorse. They are fun to watch swim and this one had just stopped for a rest. The jellyfish area is popular and there are places to sit and watch. These are sea nettles. This is the top of the huge tank. We were lucky and arrived at feeding time. As always it was a fun trip and I look forward to visiting again.